The Debian distribution is dynamic and changes continually. Most of the changes are in the Testing and Unstable versions, but even Stable is updated from time to time, mostly for security-related fixes. Whatever version of Debian a system runs, it is generally a good idea to keep it up to date, so that you can get the benefit of recent evolutions and bug fixes. While it is of course possible to periodically run a tool to check for available updates and run the upgrades, such a repetitive task is tedious, especially when it needs to be performed on several machines. Fortunately, like many repetitive tasks, it can be partly automated, and a set of tools have already been developed to that effect. The first of these tools is apticron, in the package of the same name. Its main effect is to run a script daily (via cron). 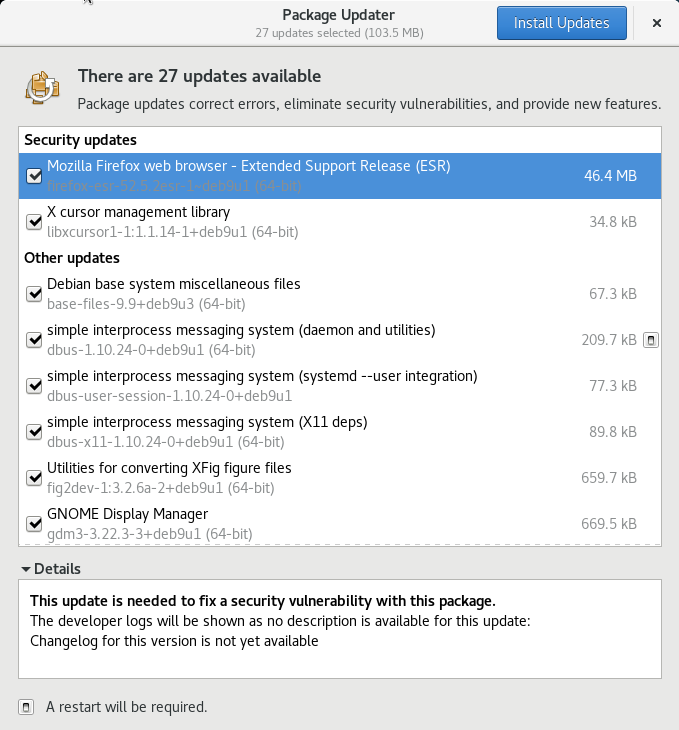 The script updates the list of available packages, and, if some installed packages are not in the latest available version, it sends an email with a list of these packages along with the changes that have been made in the new versions. Obviously, this package mostly targets users of Debian Stable, since the daily emails would be very long for the faster paced versions of Debian. When updates are available, apticron automatically downloads them. It does not install them — the administrator will still do it — but having the packages already downloaded and available locally (in APT's cache) makes the job faster. This option allows you to specify the frequency (in days) at which the package lists are refreshed. apticron users can do without this variable, since apticron already does this task. Again, this option indicates a frequency (in days), this time for the downloading of the actual packages. Again, apticron users won't need it. This option covers a feature that apticron doesn't have. It controls how often obsolete packages (those not referenced by any distribution anymore) are removed from the APT cache. This keeps the APT cache at a reasonable size and means that you don't need to worry about that task. When this option is enabled, the daily script will execute unattended-upgrade (from the unattended-upgrades package) which — as its name suggest — can automatize the upgrade process for some packages (by default it only takes care of security updates, but this can be customized in /etc/apt/apt.conf.d/50unattended-upgrades). Note that this option can be set with the help of debconf by running dpkg-reconfigure -plow unattended-upgrades. Other options can allow you to control the cache cleaning behavior with more precision. They are not listed here, but they are described in the /etc/cron.daily/apt script. These tools work very well for servers, but desktop users generally prefer a more interactive system. That is why the “Debian desktop environment” task installs gnome-packagekit (at least when you select GNOME as desktop environment). It provides an icon in the notification area of desktop environments when updates are available; clicking on this icon then runs gpk-update-viewer, a simplified interface to perform updates. You can browse through available updates, read the short description of the relevant packages and the corresponding changelog entries, and select whether to apply the update or not on a case-by-case basis.